The Trim Plus from Remington is more than just a grooming equipment for men. It comes with 11 pieces so that you can look clean and well-groomed. It comes with a charge stand and where you can store all the accessories with ease. The product is suitable for getting rid of hair in difficult areas. You can use it for ear and nose hair removal, beard and mustache trimming and sideburns, jawline and neckline shaping. The blades are sharp and the device itself is robust. If you can take care of it, the whole thing will last a long time. 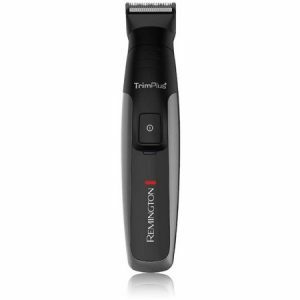 The grooming kit includes a full-size trimmer, body hair trimmer, nasal and ear hair trimmer, detail trimmer, hair cut clipper comb with 10 different length settings, three beard and stubble combs, body trimming comb and charging stand. It runs on lithium power which is capable of providing up to 70 minutes of cordless operation runtime after charging for only four hours. Many devices require 12 to 16 hours of charging! The Trim Plus is super-fast and ultra-strong when it is about charging and usage. If you are someone forgetful, this tool should be handy because it features emergency charging. A quick charge of five minutes is going give you enough power for one trimming session. The blades are crafted from stainless steel which makes this device commanding, all-powerful and capable. It can glide through facial hair smoothly without causing any irritation or pain. The geometry of the blades is innovative meaning it can let the user have a supreme and exemplary experience. You can also remove body hair effortlessly. If other trimmers were painful during removal of nasal and ear hair, this one will make a difference. The adjustable comb for hair cut has settings for length starting from 2mm to 20 mm which makes it perfect for an even cut. The stubble combs will let you maintain that trendy look going on now because it has combs from 3.0 mm to 9.0 mm. The charging stand will let you store all the parts so that nothing gets lost. Maintenance is simple with this device and its attachments. You should lubricate it from time to time to make it run smoothly. If you ever turn it on and does not work, do not get scared. It simply requires charging or the unit is dirty. Use the cleaning brush for getting rid of dust and stray hairs. The product is strictly for dry shaving only. Do not make it come in contact with water in any way.